Is Jesus Sleeping Through Your Storm? Matthew 8:23-27 NKJV Now when He got into a boat, His disciples followed Him. And suddenly a great tempest arose on the sea, so that the boat was covered with waves. But He was asleep. Then His disciples came to Him and awoke Him, saying, “Lord, save us! 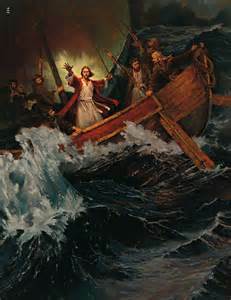 We are perishing!” But He said to them, “Why are you so fearful, O you of little faith?” Then He arose and rebuked the winds and the sea, and there was a great calm. So the men marveled, saying, “Who can this be, that even the winds and the sea obey Him? Wow! This was a “suddenly” that the disciples didn’t anticipate or enjoy. Jesus had given the command in verse 18 to “depart to the other side”, but the disciples had no idea that the trip across the sea would be such a tumultuous one. This story is one that all of us have had or will experience at one time or another in our brief journey through life here on planet earth. The question to us then becomes that which the Lord Jesus asked of His disciples….”Why are you fearful, O you of little faith?” I’ve heard the Lord speak that question to my heart a few times in my journey to the other side. Jesus has always been in my boat and at times it seemed like He was “fast asleep”, like in a coma, and I couldn’t awaken Him. My prayers seemed like they bounced off the ceilings and I appeared to be going down for the third time, without my life jacket. But notice that Jesus questioned His disciples about two things…..fear and faith. He first asked the question, “why are you fearful?” An acronym for “fear” according to Joyce Meyer is “False Evidence Appearing Real”. Fear often tries to carry us into the realm of the worst possible case scenario. In this case the disciples feared perishing, dying, losing all that they had and their lives as well. The definition of “perishing” according to the Merriam-Webster dictionary is to “become destroyed or ruined; cease to exist”. So the disciples were immediately hit with the worst thing that could possibly happen to them delivered through this storm: they would be destroyed, even to their death. It hit them hard; a blow of supernatural strength, that in their mind’s eye would ruin them. So, it is with us, when the devil brings a storm into our lives that seems to have the propensity to destroy our health, our home, our family, our marriage, our finances, our lives. FEAR – false evidence APPEARING real. That’s right, appearing real….. The other thing Jesus addressed with His disciples was their “little faith”. The word for those two words in the Greek, according to Strong’s Concordance is oligopistos, which is taken from oligos, “small”, and pistis, “faith”. It describes a faith that lacks confidence or trust too little. Another way to describe it is an “underdeveloped faith”. It doesn’t mean outright unbelief or distrust, but simply a faith that is in the process of being strengthened and matured. The storm that seemed to arise out of nowhere, that was fueled with what appeared to be unnatural, hurricane force winds, rain and waves, tested the faith of Jesus’ disciples. It helped to locate their trust and confidence; it uncovered a need to draw near to Jesus, to depend on His strength and ability to calm, not just the storm as it raged around them, but their innermost beings. Their faith needed developing. This is where the rubber meets the road, so to speak. It is a time when we see our inability beside God’s ability. It causes us to look within and see our need to dig our heels in and firmly declare that our God is Lord over the storm and regardless of what it looks like to us, His presence in the midst of our storm brings a calm assurance that it will be okay. My friends, it just takes one word from our God to totally change the atmosphere, causing the peace to come in the midst of a troubled, stormy situation. Immediately when you call on the Lord in your storm, He arises to meet your need. It may not seem like the storm is calming, but our perspective is not the same as Gods. This morning my husband and I, being new to this area, were looking for an address. He was explaining to me that one road went on one side of the lake and the other one went on the other side. I was having difficulty picturing it in my mind so Gerald told me I should look up the map on google earth to become familiar with the area. He said it looks totally different when you are looking down on it than when you are driving around it. Immediately the Lord spoke to my heart that He sees things from a perspective far above what we see in the natural. While we are experiencing the turmoil of the storm we need to draw from His perspective above the storm. When we set our minds on things above as we are experiencing the storms of life we are enabled to see them from a different perspective. Paul writes to the Colossians in chapter 3:2, 3: Set your mind on things above, not on things on the earth. For you died, and your life is hidden with Christ in God. Yes, we will experience trouble here on this earth, but we belong to God and the as His children He has a good plan for our lives. If you are going through a storm right now, give God time to unfold the plan He has for you and to work out the details. Remember that fear and faith cannot co-exist. Rebuke the fear and feed your faith by spending time in prayer and the Word; listen to faith-filled ministers who preach God’s word of truth and power to encourage you and build you up; feed your spirit through inspiring Christian music and spend time with believers who will encourage you to stand strong until the storm is over. Believe that God is at work. He never sleeps nor slumbers and He is never late, but always right on time! Father, I thank You for being God, for being Lord, over the storms of life. I declare you Lord over the wind and the waves, the rain and the appearance of potential destruction. Your name is above all names that would appear real in our lives, that of destruction that would try to come to bring ruin to our families, our homes, our health, our finances, our nation. Father, You are God! There is none above you nor beside You! You reign supreme over all that we would encounter in this life. I pray that right now You would calm the storms that are raging in people’s lives that may be reading this blog. I speak life to all that appears to be dead; life, in Jesus’ name! I ask You to comfort, strengthen and encourage those who are hurting and who need Your presence close to them right now. I pray that You will reveal Yourself to them, showing Yourself strong on their behalf. Give them new life, new health, new opportunities for success in Jesus’ name. Amen.